As Wedding Photographer for Brooklyn Winery it is essential to capture each detail of a couple’s special day. This image taken at a Brooklyn Winery wedding shows off the bride’s gown. The winery is full of vintage charm and decor that has been crafted from local sources. Much of the wood in the venue comes from reclaimed martial, and the space boosts a variety of one-of-a-kind details throughout its interior. These details make being a Wedding Photographer for Brooklyn Winery a truly wonderful experience. 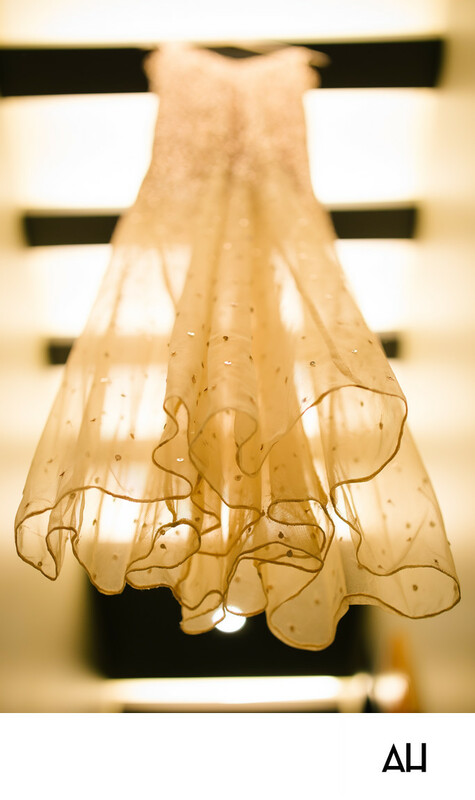 The picture displayed shows the sheer overlay of the bride’s gown as it hangs from narrow wooden rafters. Above the rafters, natural light filters into the room and illuminates the dress. Even from this view, one can tell that the dress is not a typical, traditional wedding gown. This sheer, glittering layer will soon be slipped on over a champagne colored silk layer of the dress. The unique gown will make the bride appear as an even more enchanting figure as she and the groom begin their journey as wife and husband. For now, the dress floats in the sunlight, looking like a gown fit for a fairy princess or an angel. The sequins and gems on the dress shimmer in the warm glow that falls gently over the gown. The gems begin close together at the top of the dress, covering the bodice. As the line of the dress flows down, the gems become more spread out, sprinkled over the sheer skirt like stars in a clear night sky.